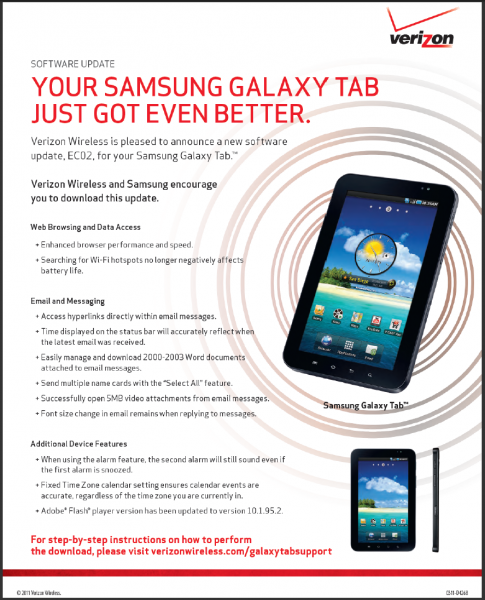 See, Verizon hasn’t forgotten about its version of the Samsung Galaxy Tab! 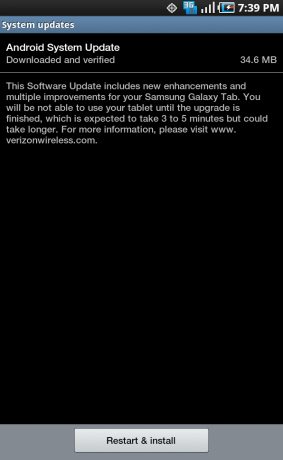 An update is primed and ready to roll out and includes a bunch of fixes, but is definitely not Honeycomb. In fact, we’re still not sure that it will ever officially see Android 3.0, so instead, try to focus on the fact that this device which is now down to $199 on contract, is still getting some love. +Enhanced browser performance and speed. +Searching for Wi-Fi hotspots no longer negatively affects battery life. +Access hyperlinks directly within email messages. +Time displayed on the status bar will accurately reflect when the latest email was received. +Easily manage and download 2000-2003 Word documents attached to email messages. +Send multiple name cards with the “Select All” feature. +Successfully open 5MB video attachments from email messages. +Font size change in email remains when replying to messages. +When using the alarm feature. the second alarm will still sound even if the firs t alarm is snoozed. 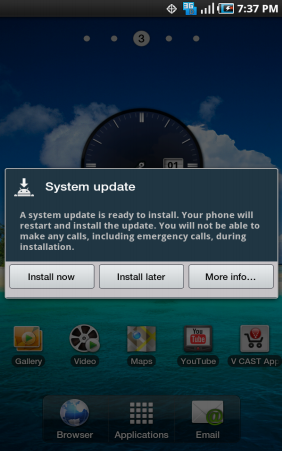 +Fixed Time Zone calendar setting ensures calendar events are accurate. regardless of the time zone you are currently in. +Adobe” Flash'” player version has been updated to version 10.1.95.2.